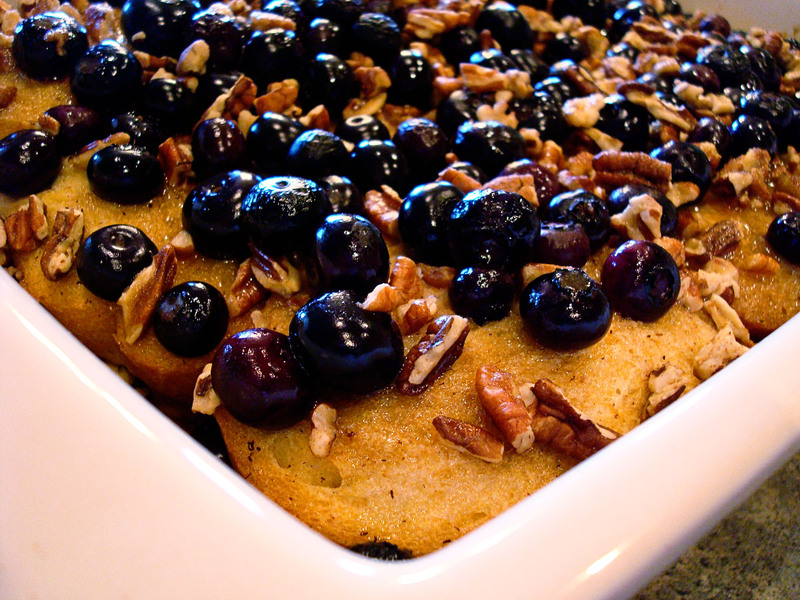 Baked French toast, or bread pudding, always reminds me of my mom. She loves it. And so do I! It’s comforting, warm, and best of all, full of carbs. 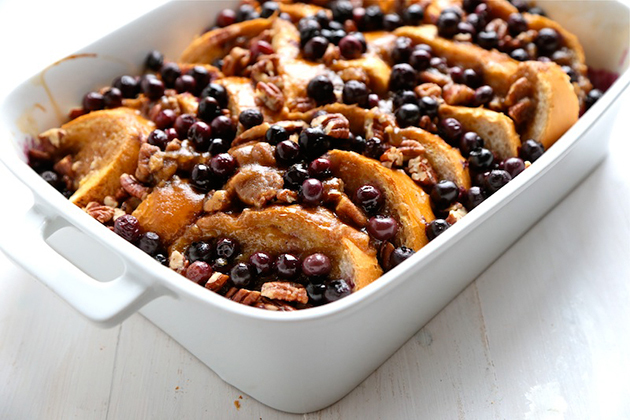 When I found Mel’s recipe for Baked Blueberry Pecan French Toast, that was it—I had to share it. 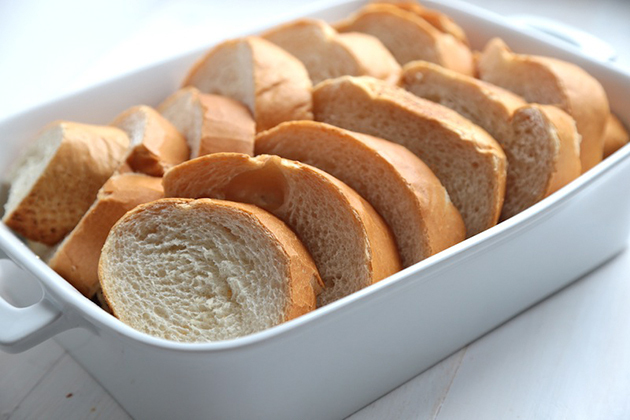 Slice your loaf of baguette or French bread into 1 1/2 inch slices. Lay the slices on the bottom of a 13×9 baking dish. 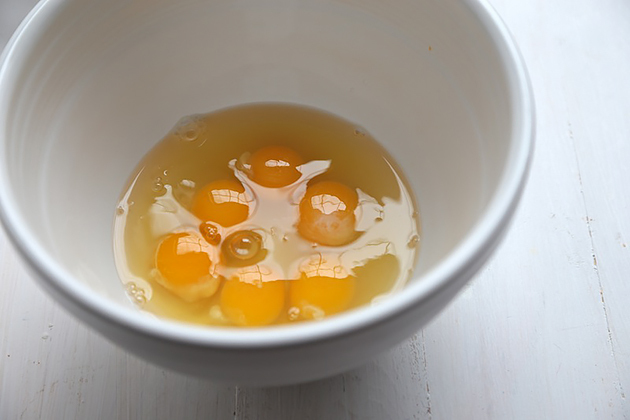 Into a large bowl, crack the six eggs. 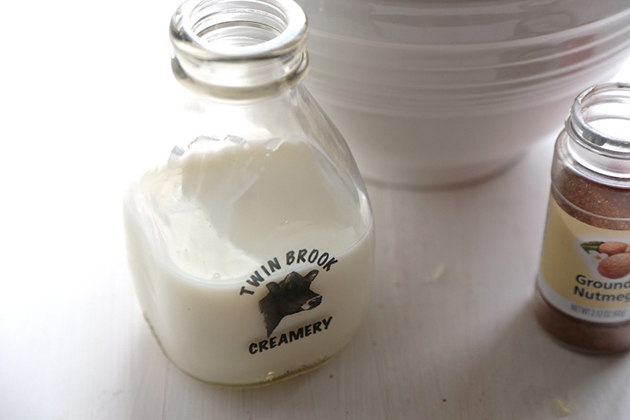 This is what makes this baked French toast really custardy. Add in the vanilla, nutmeg and 1/2 cup of brown sugar. Next, pour in the milk. 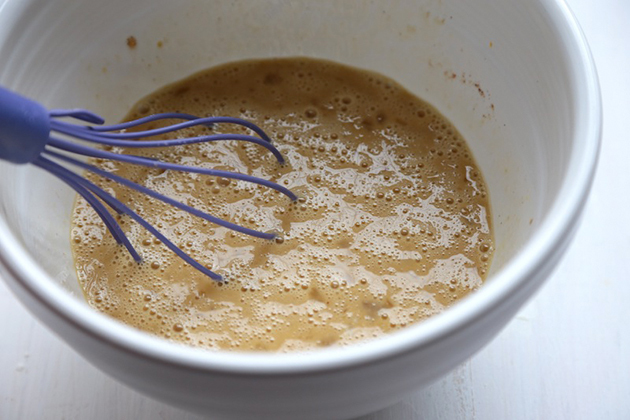 Whisk together the egg and milk mixture until the brown sugar is mixed in and evenly distributed. 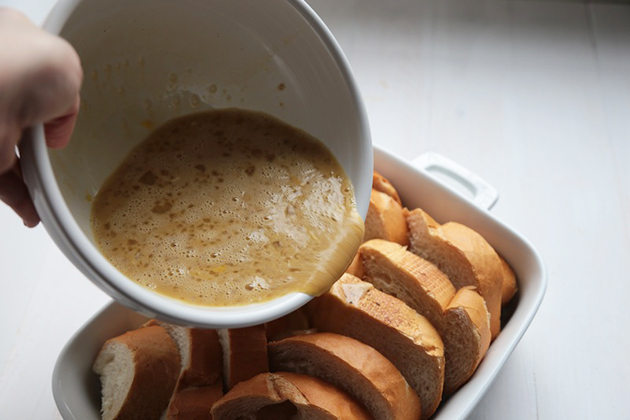 Pour the egg and milk mix over the top of the bread in the baking dish. 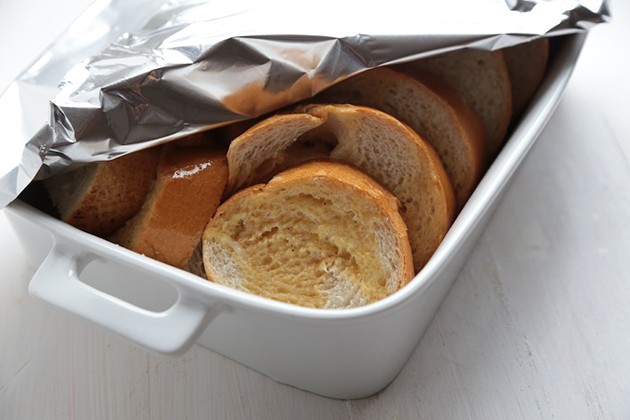 Cover the bread with foil and place in the fridge to let the bread soak in the eggs overnight. 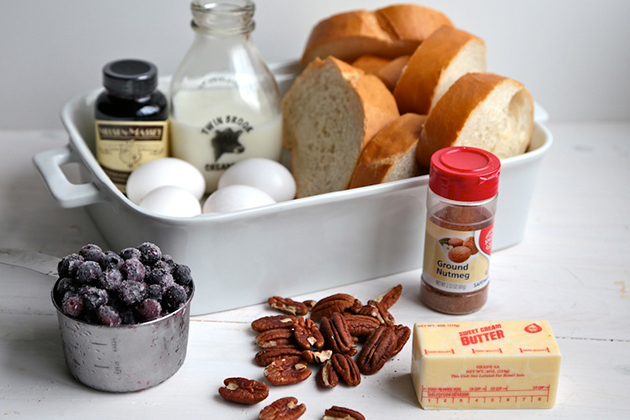 Mel suggests toasting the pecans the night before baking, while the French toast is resting in the fridge. 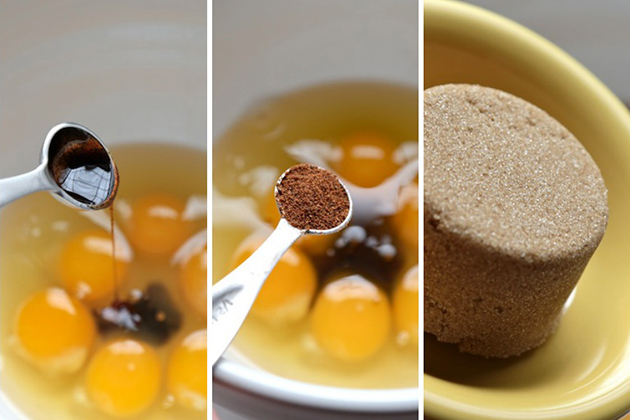 This will save you time the morning you bake your French toast. 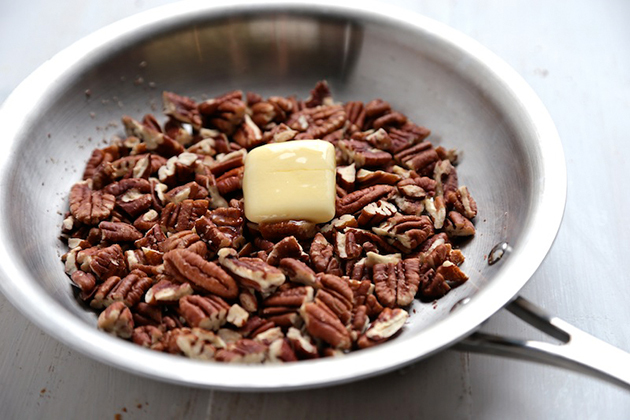 In a skillet or pan, toast the chopped pecans over medium heat until they become fragrant. Add in the butter and coat the pecans. Remove them from the heat and set aside. The morning you bake your French toast, preheat your oven to 350ºF. 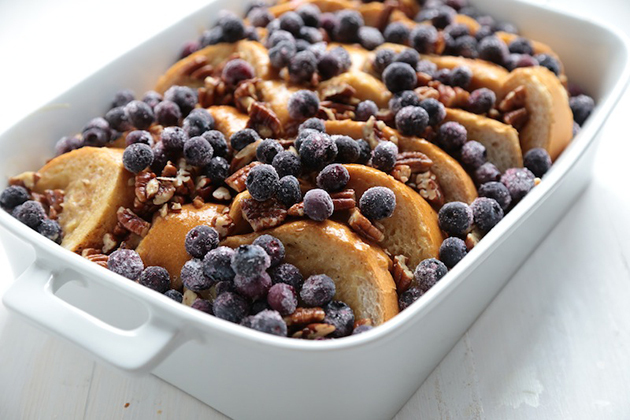 Uncover the French toast and top with the buttered pecans and blueberries. I had two gallons of frozen blueberries that my husband and I picked from last summer. They worked just great since we didn’t have fresh berries on hand. 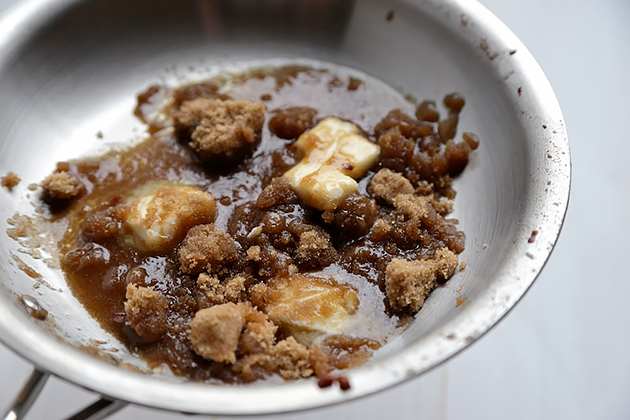 In a saucepan, cut the remaining butter into cubes and mix in the remaining brown sugar. Bring the butter and sugar to a simmer and stir until the sugar has dissolved. Pour it over the top of the French toast. Now, you’re ready to bake! Bake the French toast for 30-40 minutes. It will be the longest 30-40 minutes of your life, because this smells so good! Thanks, Mel, for this gorgeous recipe! Be sure to check out Mel’s TK recipe box and her site Mel’s Kitchen Cafe for more home cooked comfort food. Next on my must-make list is Mel’s Slow Cooker Beef Barley Soup. Megan Keno is the writer and photographer of Country Cleaver, a food blog fueled by Nutella and images of June Cleaver—if June wore cowboy boots and flannel, that is. A self-proclaimed country bum, Megan creates from-scratch recipes that range from simple to sublime and how-to’s to build your cooking repertoire. But she couldn’t do it without the help of her trusty—and furry—sous chef, Huckleberry. He’s a world class floor cleaner. This dish looks absolutely delicious. Can’t wait to try it out. Thank you for sharing! Anything that you can make the night before and cook in the morning gets my vote. Holy cow! This looks gorgeous. We can’t gat blueberries where we live, but I’m making this for sure the next time we are back in the US. Thanks for the post.